Hang onto your hats…er…spaceships (!) because Tabitha Fink, the amazing one-eyed cat, is at it again, and this time she’s heading to Mars! We first met Tabitha Fink in the delightful book Tabitha Fink: The Cat With One Eye. In that story, Tabitha Fink showed the world that she’s a pretty awesome cat, and while she only has one eye, that certainly didn’t hold her back from doing ANYTHING. In fact, it is, in part, what makes her amazing and super cool. The story has a great message for kids to be what they want, and despite any ‘differences’ they may have, they’re all pretty amazing and super cool too. Now Tabitha Fink has decided to take a trip to Mars (!) and she’s taking us along. You see, Tabitha Fink is curious about the people on Mars. How do they travel? What do they eat? Do they like to paint or perhaps draw? When Tabitha Fink arrives on Mars, she quickly meets the local Martians. A charming group of smiling folks, they show Tabitha Fink around the landscape. The curious cat learns all about local food and customs. But then she spots a little Martian who is quite shy. Will Tabitha Fink be able to help the little space child conquer his fears? When I saw another Tabitha Fink book arrive for review, I grabbed it for myself. I reviewed the first book about this wonderful one-eyed cat (did you know there is a real Tabitha Fink? – you can learn more about her/see a photo at the author’s website). Like the first, this tale is told in simple rhyme that keeps the story moving at a brisk pace. The story is adorable and the illustrations are absolutely perfect. Perhaps the most creative thing here is the use of imaginary things that the Martians use, and that the author actually manages to find words to rhyme with these odd-sounding creations. Try rhyming “Flipperty-Flang” with something that doesn’t sound forced! Overall, this is another book that young (and old) cat enthusiasts, as well as those who simply enjoy a fun story, will love. 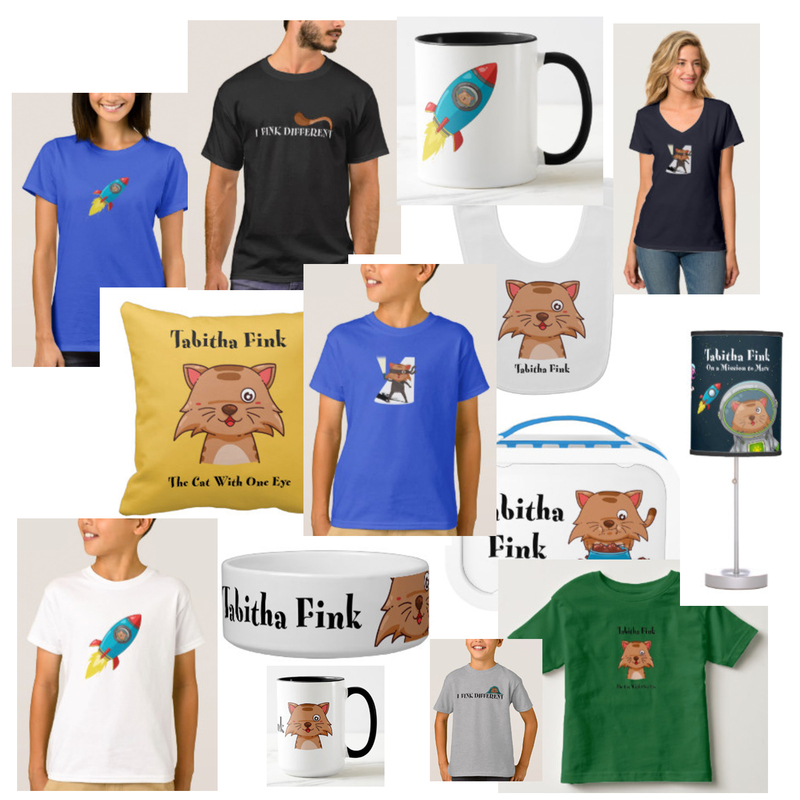 Click here to be redirected to the Tabitha Fink Zazzle page.